Being excused lawnmower duty because of the weather I thought I would try and sort out one of my stalled projects. 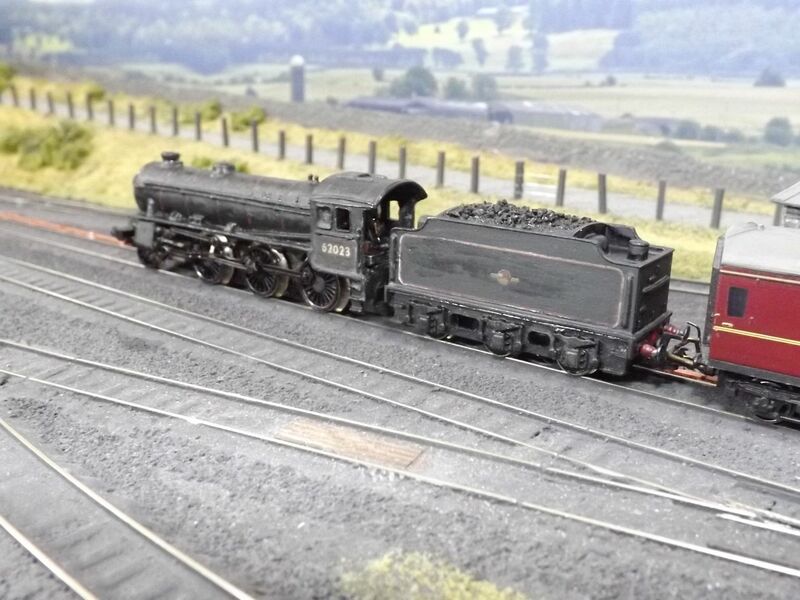 This one started when I was browsing Ebay and spotted a kit-built "B1" - Langley body, unpowered Farish Black Five chassis and Union Mills tender. 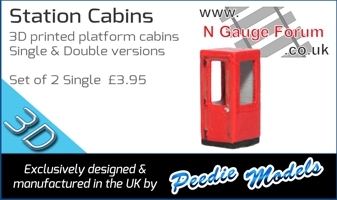 I bought it with a view to fitting the tender to one of my Farish J39s, then putting a spare motor in the Black Five chassis so I could sell it and get some of my money back. It all went wrong: the UM tender drive was a bit tired, had gear meshing problems and was no better than the Farish tender drive even after much fiddling. The Black Five chassis limped along the track - quartering out on one wheelset and a damaged axle drive gear. On the other hand the B1 body and tender were nicely painted and lined out, so it seemed a shame not to do something with them. 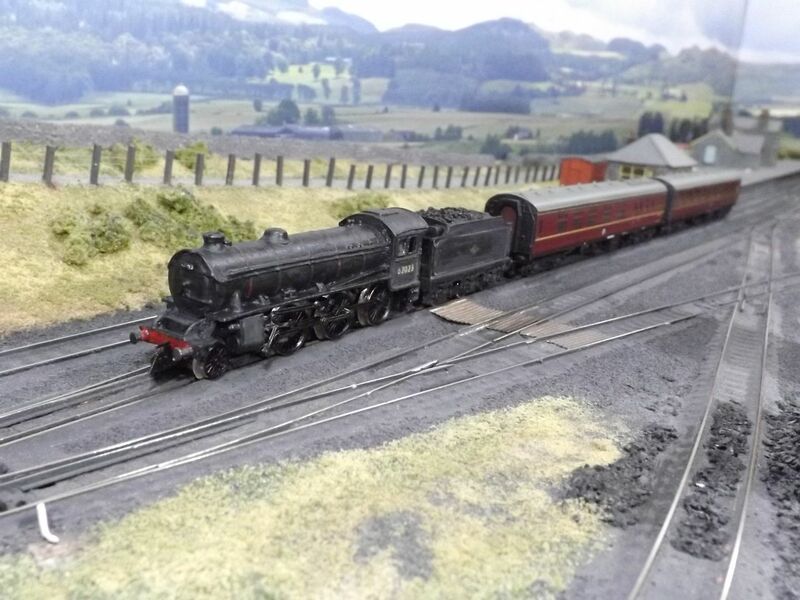 The Langley B1 kit, like almost everything that uses the old Farish Black Five chassis, suffers from the driving wheels being much too small. So it doesn't look much like a B1. What looks like a B1 but has smaller driving wheels? A K1 of course. Comparing photos of the two I reckoned they looked similar enough, apart from the pony truck and cut-away front footplate on the K1. So I set to work. First job was to acquire a chassis that worked. I picked up one on Ebay, test run only, at a fair price. It turned out to be an early example with brass gears and 3-pole motor but seemed to run OK, and the Langley body dropped on with only a little bit of fettling with a file where the motor was catching on the sides of the firebox. The pony truck is a cut down bogie from something German, possibly Minitrix. I took a file to the curved section of the footplate by the smokebox. Tender is Union Mills, stripped of its motor. This design earths through the chassis, as it turned out it earths on the opposite side to the Farish chassis so I had to take the gears off the wheelsets and turn them through 180 degrees to get the uninsulated wheels on the right side. Drawbar is the Farish metal item with a dogleg bend to shorten it and compensate for the different mounting heights on loco and tender. Wheel rims and valve gear were blackened with a Sharpie marker pen to tone them down. I carefully removed the cabside numbers, applied some ancient Fox transfers and a coat of varnish, then gave the whole thing a wash with dirty thinners. It really needs a coat of matt varnish to finish it off. Here is the end result. 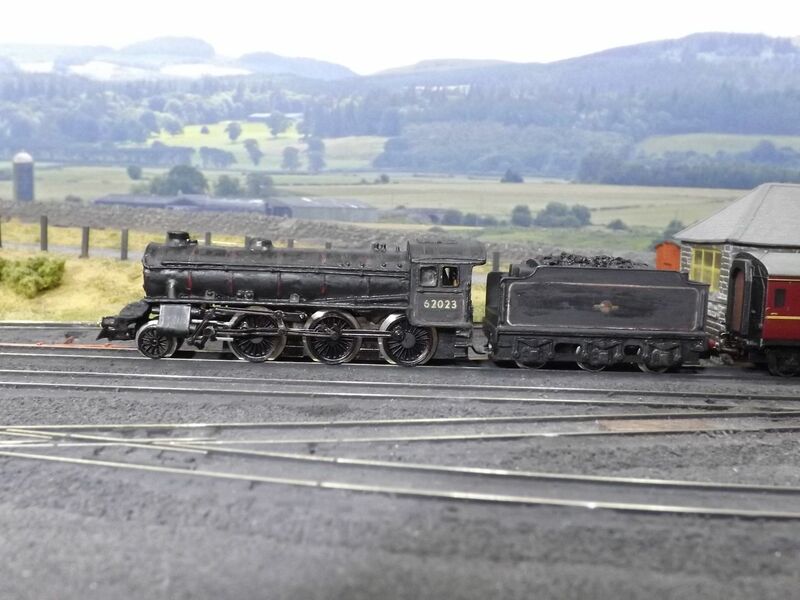 As a scale model there is a lot wrong with it - wheel spacing, valve gear, and the pony truck sits too far back to allow the flanges to clear the front footplate - very obvious in side-on view but not so noticeable from other angles. It still needs a bit of mechanical fettling - the tender has a noticeable wobble possibly because it still has traction tyres on two wheels. I might see if UM will sell me a couple of spare unpowered wheelsets. The old Farish chassis doesn't like my narrowed flangeways and the deep-flanged wheels keep finding bits of ballast in places they shouldn't be It's a rough, crude model: but I'm a rough, crude modeller and my K1 doesn't look any worse than some of my other efforts. 62023 was a Northumbrian engine for most of its life, delivered new to Blaydon in 1949 and never strayed far from the Newcastle area. In late 1962 it went from Heaton to Alnmouth shed, who can't have been much impressed as they immediately shipped it off to Doncaster for general overhaul. It then did three years at Alnmouth, working the Alnwick branch and the local collieries, and after Alnmouth closed it finally ended up at Tyne Dock where it didn't quite see out the end of steam in the North-East. Withdrawn June 1967 (Tyne Dock's other K1s lasted a couple of months longer) and cut up by the end of that year. I was never totally happy with it so it languishes in my display cabinet. I always meant to do another UM powered one but have just not got round to it. They were never Waverley Route locos (I haven't found a single picture anyway - happy to be disproved) so I guess it was not vital to have one. I took (I think) about 6 mm out of the length and re-joined the body. I did wonder about shortening it slightly but from what I have read there was only about a foot difference overall - shorter boiler but longer firebox on the K1. With hindsight I should perhaps have taken out a couple of mm just behind the smokebox so that the steampipes lined up with the cylinders, but never mind. I can see why you used the Kato chassis, wheel spacing, cylinders and valve gear all look right, shame about the world's biggest motor. You would have thought the Japanese could do better than that. And here was I expecting to find that you had 'strayed' into NG and built a BEYER-PEACOCK K1; the first-ever 'Garratt!! A nice model and 'conversion though - thanks for sharing it with us. The section I cut out may have been 4mm, I know I checked it to a drawing and actually kept it for a long time but can't find it now. To me one of the most notable differences between the B1 and K1 boilers is the position of the boiler bands so I made sure I replicated that. Yes, that motor spoiled the whole effect. A UM Group Standard tender would have provided a part solution but pickup would be a challenge as the Kato chassis has traction tyres on the front wheelsets and the UM chassis only picks up one side (For this loco I adapted a standard Farish "LMS" chassis with tender pickups). If and when I have time to do a next scratchbuild project I think it may be a more useful (for me) D34 "Glen". This was done some time ago in 4mm there was an article but I cannot remember which magazine it was in, if you wish to convert the Farish B1 it may give you a clue what to do and how, mainly lengthen cab sides, shorten boiler, make a pony truck, change front end and adapt valve gear for a 2-6-0, detail. The wheels will be the wrong size but working in N Gauge you could get away with it, I did with my converted Langly B1 to a K1 many, many moons ago. Food for thought indeed - will need to search for that conversion article. Wheels shouldn't be an issue - I'd switch them out for some Farish 3MT wheels which will be closer in size. Would need the cylinder block moved back a-la my K3 I think too, but having done this once it's not insurmountable. Thread resurrected, just like my "K1". This was my first attempt at building a loco that wasn't available either RTR or as a kit, and four years ago I was pretty happy with it. But it wouldn't run on my code 40 trackwork, so has sat in a box unrun and unloved since 2015. I acquired a non-running Chinese Black 5 (fine profile blackened wheels) which turned out to have a 4-pole motor, so I dug out a spare armature from my box of broken dreams and soon had it working. That gave me a chassis for the K1. I decided to rework the body and get rid of some of the worst faults. I took a slice out of the boiler and footplate just behind the smokebox: fitted smaller wheels to the pony truck so I could move it forward: cut the dome off and made a new one to sit further back: carved off the cast-in handrails ready to fit separate wire ones: built up the cylinders with Plastikard and filed them to something approaching the correct shape: and made a new chassis for the tender with the correct wheel spacing. The tender chassis is an experiment, being made from black Plastikard with the axles running in brass tubing. It has pickups on the outer two axles. Lots of work still to do, but comparing the side-on view below to the one at the start of the thread I think I'm headed in the right direction. I seem to have a Mogul thing going on: I now have four, with three more planned (K3, Standard 2MT and 4MT). You can never have enough mixed traffic locomotives. I think the B1 boiler and cab could also be the basis for the Thompson 01 and 04/8 280s. The dia. 100A boiler was also used on the B2 (Thompson)(Langley), B3/3, B17/6 (Dapol variation-I've never checked? ), and 02/4. The K1 (Thompson/Peppercorn) had a dia.116 boiler, which was a shortened 100A, and the cylinders were the same as B1. I'm sure I've seen articles on some of these somewhere, but haven't a clue where or when. The K1 used the Kato chassis-was it in the Journal? Here is the K1 I made many years ago before the Farish B1 had even been thought about, it uses a much butchered Langley B1 kit on said Kato chassis with a Farish tender underframe. Let's just say it was of it's time, the motor was large and impossible to disguise, it really doesn't hold a candle to Dr Al's creation. If you want to see a really good K1 check that out. That's an interesting thought. Langley B1 body on a Farish 8F chassis? Not that I need a big 2-8-0 for my little branch line. Roy-very nice job of the K1. 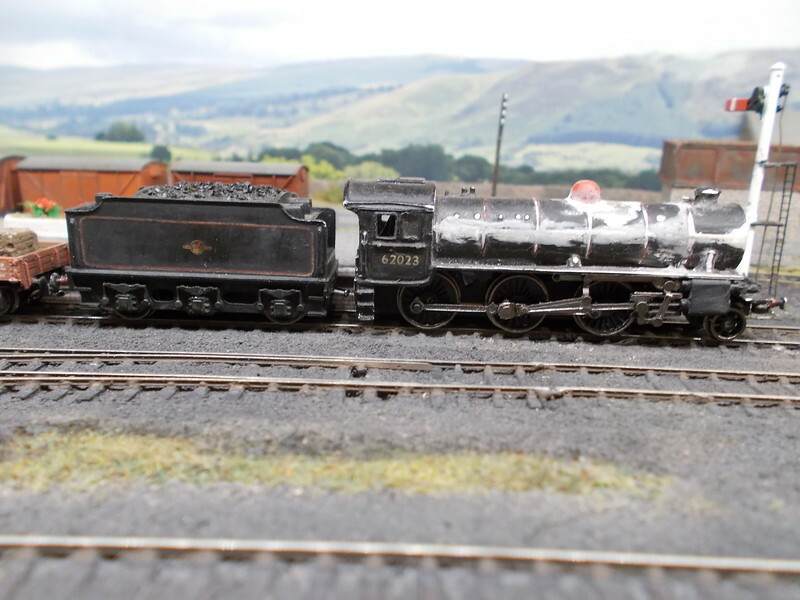 belstone-I think I have seen what you suggested, an 8F chassis under the Langley boiler and cab; but it was some time ago, and I can't remember where I saw it. It's the was I would go about it.